If you are like me, I often search the web for swatches of nail polish colours that I am interested in buying. Now, I’ve been told that I have long nail beds, but unfortunately, due to the crazy amount of lacquer painting that I do on a constant basis, my nails have become thin and chip quite easily. I long for beautiful nails, but don’t want to spend the money/do the damage that acrylics can cause on natural nails (they are damaged enough already). 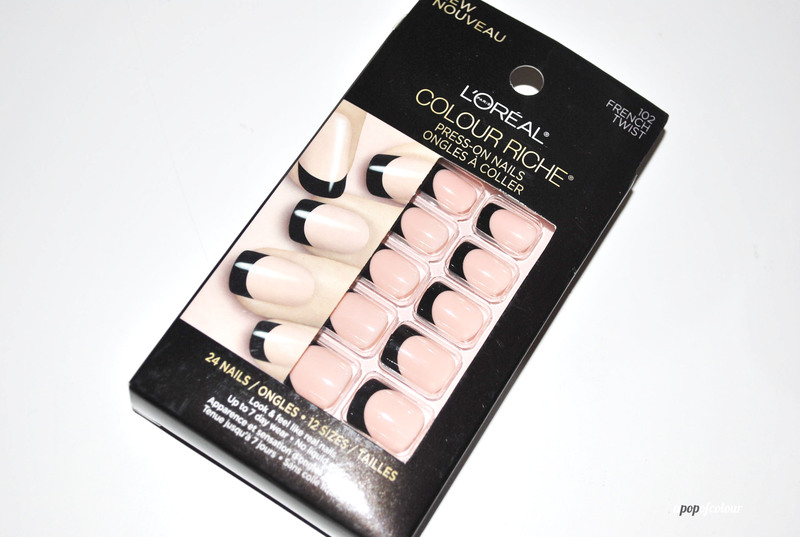 Well, lucky for us nail-challenged folks, L’Oreal Paris is releasing their Colour Riche Press-On Nails next month (July 2013). Press-on nails have been around for a while, but unlike other brands, the L’Oreal version doesn’t have glue. Instead, you put a separate adhesive on your natural nail and then press on the fake one, and voila! Fake nails that look gorgeous, natural, and totally embrace the whole nail art trend. I received three different ones to try, Moon About You, French Twist, and Cross The Line. I chose to try Moon About You first because I’ve always loved the look of the half-moon mani but lacked the talent to actually pull it off properly (plus patience to let it dry). Application is super easy for these. 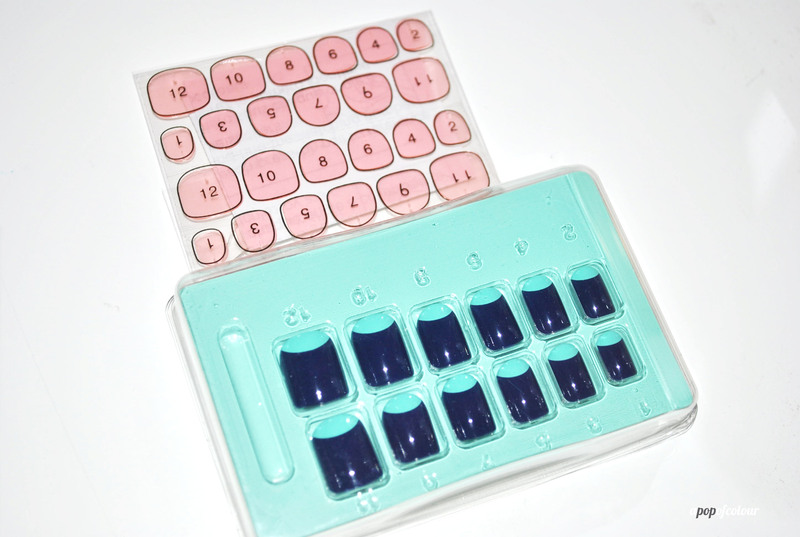 First, pick out the nails that fit your real nails and then look at the back of each one for a number which corresponds with the numbers on the adhesive. Peel off the adhesive, apply it to your bare nails, press on the fake nails and you are good to go. L’Oreal recommends that you don’t get your nails wet within the first hour so the adhesive will set properly. So how do they hold up? L’Oreal says they are supposed to last for seven days, which some of mine have. I have had to reapply a few nails throughout the week (make sure you hold onto the adhesive and spare nails! ), which isn’t bad considering I taught four fitness classes, went to the pool twice, type daily, and had more than a few showers in that time. 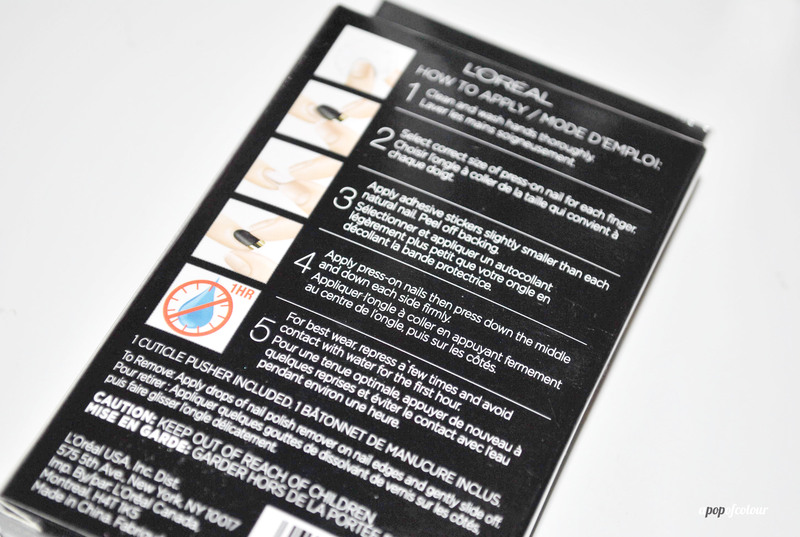 To remove the nails, L’Oreal says to apply nail polish remover around the edges and they should come right off. I have to give a huge kudos to L’Oreal Paris for these. I absolutely love wearing them and as shallow as it sounds, they actually make me feel happier to have nice-looking, long nails. I have gotten so many compliments and people asking to “see my nails” (a lot of people think they are the sticker ones, so therefore they look pretty natural to the eye). It’s also nice to kind of give my real nails a break from polish, so they can actually grow out (although they aren’t really breathing with the fake nail on top). 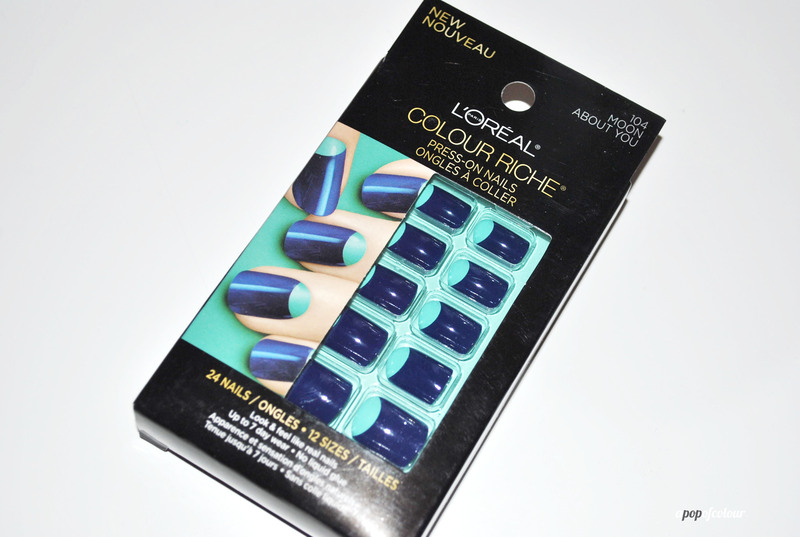 L’Oreal Paris Colour Riche Press-On nails retails for C$14.99 and will be available in July 2013. 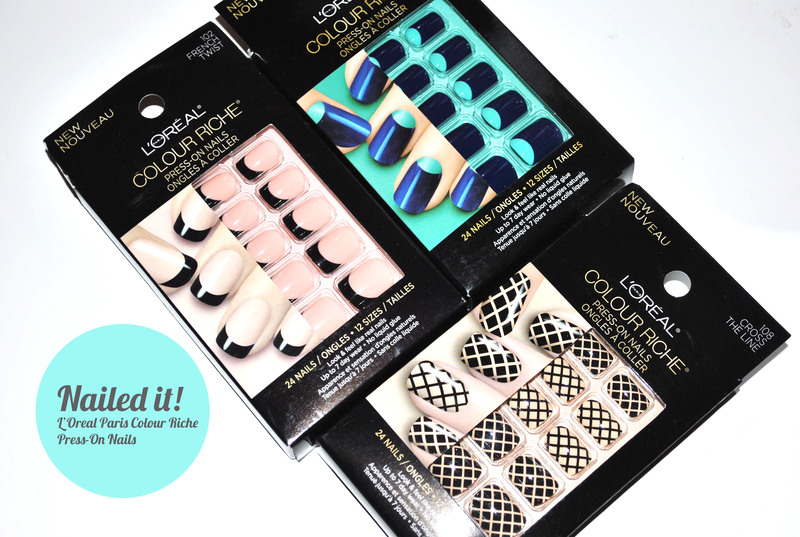 Are you excited to try L’Oreal Paris’ Colour Riche Press-On Nails? Please note, I was given these products for editorial consideration/review from the company. All opinions are my own. The packaging says 24 tips, but your picture only show 12. The 12 other are also in the package right? Why is there 10 different sizes ?